The VIA EITX-3002 combines a choice of either a 1.0GHz dual core VIA Eden X2 or 1.2GHz dual core VIA Nano X2 E-Series processor and the VIA VX900H media system processor, bringing excellent hardware acceleration for the latest HD video formats including MPEG-2, H.264, VC-1, WMV9, and HDCP for Blu-ray content protection in stunning 1080p display. With support for dual independent display, different content can be viewed in different resolutions for superior digital signage displays. The specially developed slim-line board offers a full featured I/O specification in a unique dual coastline configuration. Designed for a wide range of embedded applications, devices based on the EITX-3002 can be used to create thinner designs with a low profile system less than 36mm high. The rugged EITX-3002 offers absolute stability under extreme conditions including temperatures ranging from -10°C to 65°C. Dual I/O coastlines include an HDMI port, VGA port, two Gigabit Ethernet ports, dual COM ports, four USB ports, two USB 3.0 ports (optional), audio jacks and power and HDD activity LEDs. The VIA EITX-3002 includes an onboard DC-to-DC converter supporting both AT and ATX power modes, and power input voltages of DC 7V to DC 36V. An on board built-in 5-wire/4-wire USB Touch interface makes the EITX-3002 highly suited for high-end interactive touch screen multimedia applications. The VIA EITX-3002 also adds support for Windows 7, Windows Embedded Standard 7, Windows Embedded Standard, Windows XP, Debian Linux and Android 2.2 operating systems. 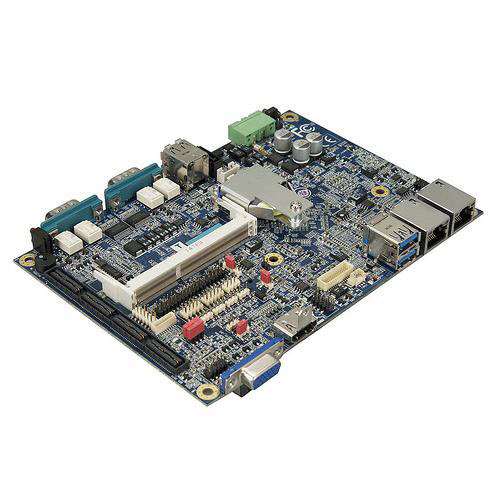 The VIA EITX-3002 is based on the unique Em-ITX form factor, placing both the VIA Eden X2 or VIA Nano X2 E-Series processor and VIA VX900H MSP on the reverse side of the board, optimizing available board real estate and facilitating simple fanless chassis designs.